The dinners of the pre-World War I era were very political affairs, attended by Cabinet ministers, and The Anchor Society tended towards the Whig or Liberal interest; in 1909 Winston Churchill, then President of the Board of Trade, was the guest of honour. The after dinner speeches were regarded as being significant public statements. 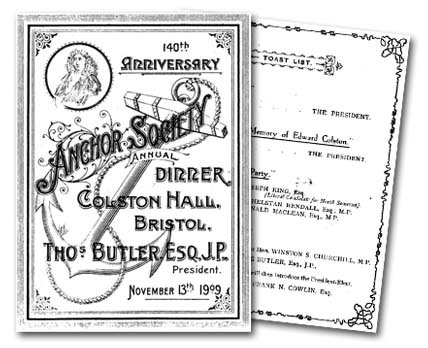 The menu for the 1909 Dinner held in Colston Hall, including a toast to The Liberal Party and a toast to the President proposed by Winston Churchill.